The Fox River Trail is a 25 mile trail along the Fox River in Brown County, Wisconsin. The first 10 miles of the trail are paved as they run through urban areas of Green Bay parallel to the river. When the trail reaches De Pere it diverts from the river and the unpaved section runs through agricultural areas towards Hilbert. The trail was funded through two Transportation Enhancements Grants as well as funding through the American Recovery and Reinvestment Act. In total $672,661 in TE funding was matched by $103,478 in local funds for a total of $776,139. The project was built in 1998 and 2009 in two phases. The Fox River Trail connects many public parks, bars, restaurants, and retail together and is open from 5 A.M. until 9 P.M. every day. 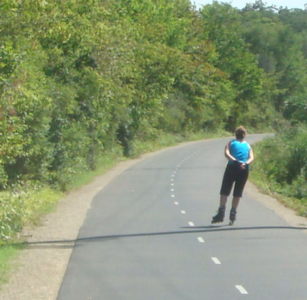 There are many excellent recreational opportunities on the trail including biking, rollerblading, and horseback riding in more rural areas. Additionally, the Fox Point Boat Launch and Bomier Street Boat Launch can be accessed from the trail and allows people to fish either from the trail or on a boat.